Hard boiled egg - 4 nos. · Roast the coconut with chopped onion,cloves,cinnamon,cardamom garlic,some curry leaves,fennel seed till coconut turns brown color and add all powders with it. · Grind the above mixture into fine paste. · Heat oil in a pan and add onion and sauté till onion is transparent. 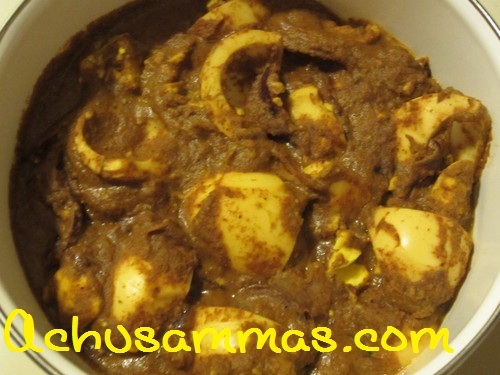 · Then add the ground coconut paste and sauté for 5 minutes then add eggs. 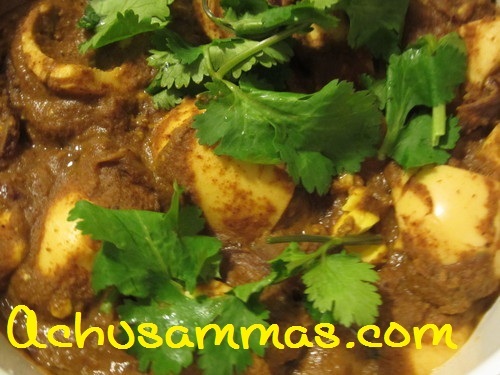 · Garnish with coriander leaves. 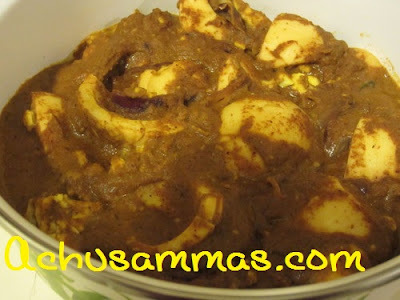 varutharacha egg curry lookes so yummy..put more and more good recipes..
Nice preparation, very spicy and yummy curry..